offer for car enthusiasts and more. 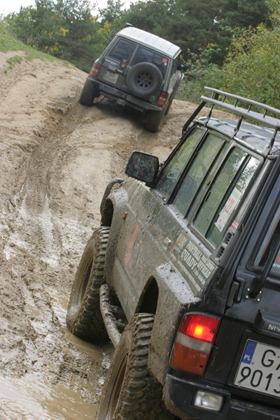 The offer includes off-road driving school, combined with a professional instructor training. A specially prepared track abounds in vertical climbs and descents, traverses, muddy ravines and rocky narrow forest paths. In addition to fun, the training will complement the practice of both experienced drivers and people starting their adventure with cars. In the car can stay 3 persons + our instructor. Land on which we base is a remnant of a motocross track, so it’s ideally suited for quad madness. Numerous conventions, ramps, drifts and obstacles will satisfy even the most demanding riders. For our guests we have the best bridging equipment in the form of quads Yamaha Briun, 4×4 model with a capacity of 350 cm 3.
ground route consisting of rope bridges, ladders, nets, wooden platforms mounted on trees at a height of about 10 to 20 meters. Participants after the training, are equipped with safe, certified climbing equipment. Under the supervision of an instructor they break their limitations and resistances, while experiencing positive emotions. specific attempt to courage. 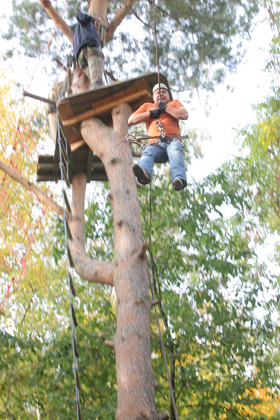 Jump from the wooden platform, mounted about 20 feet above the ground, in the crown of mighty pines. Dynamic ropes cushion the jumpers and soften the descent. Dose of positive energy throughout the day guaranteed! Passage of the so-called American railway, which means steel ropes which a stretched diagonally across the system. The participant, equipt with an appropriate climbing harness, defeats almost a halfkilometers exit route, divided into four sections. The impression of flight and the beautiful views will certainly be an amazing experience. team game on a scenery which is specially arranged for this. Obstacles in the form of barrels, walls, wrecks of cars and a bunker from World War II, form a real battlefield. Participants armed with rifles, ammunition and masks move to complete the mission. In our offer you will find many interesting scenarios like capture the flag, bunker defense or protection of the president. One of the most popular forms of recreation. The test of concentration and accuracy of the participants. We have different kinds of weapons, so each of our guests can choose something for themselves. The offer includes such equipment as guns, air rifles, classic and sports bows. Concerned about the safety of our guests we prepared professional shooting positions, and a group of specially trained instructors. 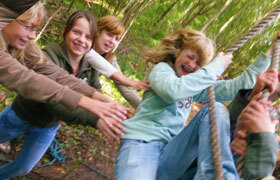 lessons include: the climbing wall, climbing on boxes and an extra big-ladder, pole climbing and many other attractions. Everything is done using professional approved equipment and with the assistance of an instructor. Tarzan the only way to the other edge of the abyss, is the transport of a liana hanging from a tree. Commando track – task known from a special troops training. Equipped with a backpack and a paintball rifle, the player is to beat a several hundred meters off-road circuit, trying at the same time shooting the marked objects. Each player has to beat a great track in the shortest time with the highest efficiency while shooting. Nordic Walking: an interesting and enjoyable form of recreation. This sport forces you to exercise most of the body and allows the muscles to burn much more calories than ordinary walking. We offer instructions connected to march under the watchful eye of our instructor. 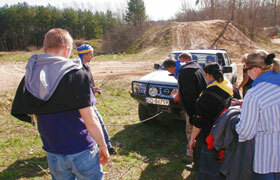 Participants benefit from the professional equipment, specially prepared to overcome this route. Area for children will be divided into age groups. 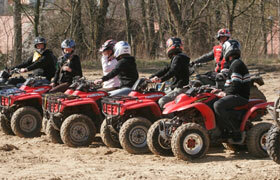 Mini Quads – paths designed for riding quads for children from 4 to 15 years. 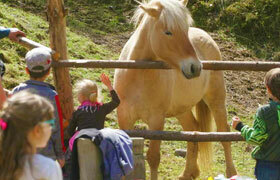 Inflatable castles and slides – here we offer for the youngest a craze on inflatable slides and jumping castles. 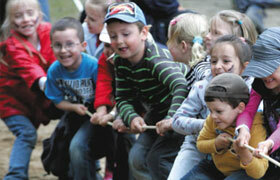 In a controlled, safe environment, children can rampage at will. Mini-rope park – fun on the ropes which are hanged out low heights above the ground.The real obstacle course for small commando. Classes in an Indian village – animation conducted in an Indian village, tipi tents.Children and young people will build here own totem, participate in Native American ceremonies, they will take part in a snake race, tomahawk throwing, and of course will take the war paint – face painting.